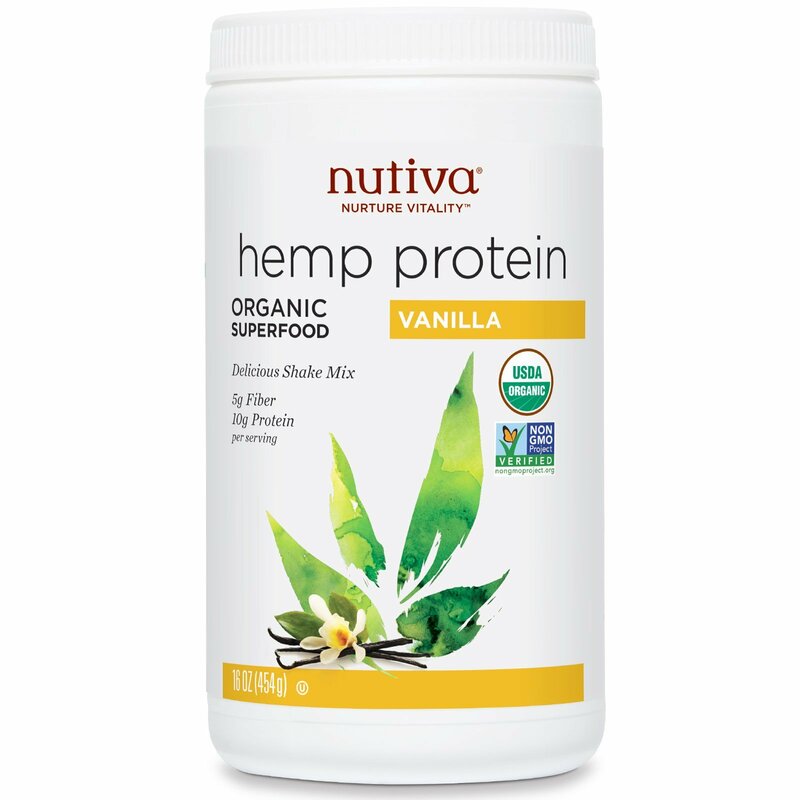 Nutiva Vanilla Hemp Protein is an energy-packed addition to shakes and smoothies- the perfect meal replacement or snack. Each serving is full of organic raw protein, phytonutrients and fiber, and contains 0 g trans fat, and no dairy or lactose. Hemp is a high-quality plant protein with essential amino acids that are vital for good health. 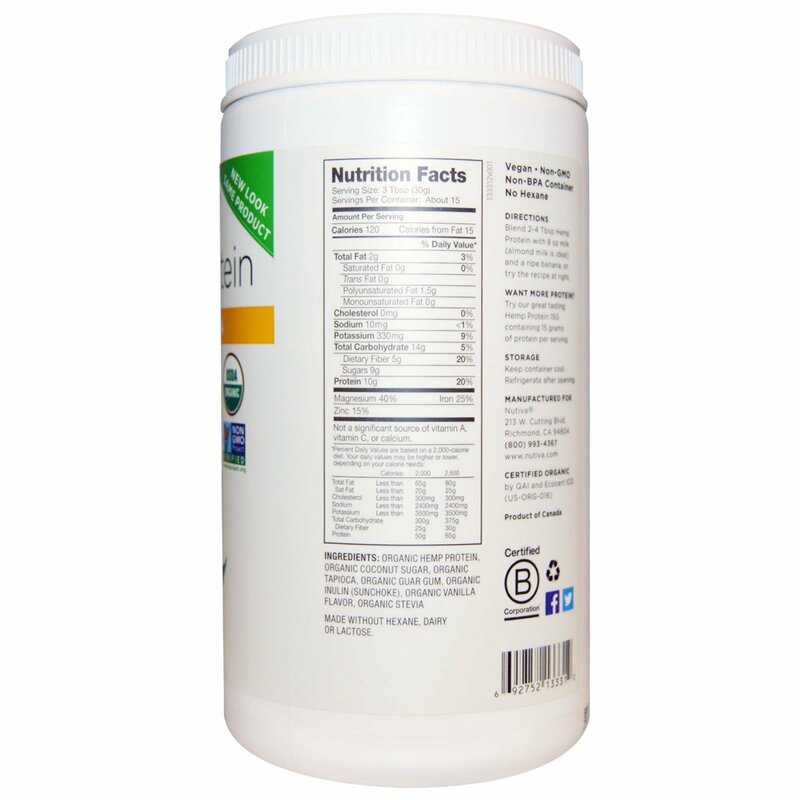 Of the protein, 66% is edestin, a bioactive protein found in no other plant that's super easy to digest. A single serving of this organic hemp protein has 10 grams of raw protein, 20% of the daily value of fiber and the bonus of good-for-you essential fatty acids (2 g per serving). Add 3 Tbsp of Nutiva Hempseed for 10 more grams of protein and 3 more grams of Omega-3. . Blend 2-4 Tbsp Hemp Protein with a 8 oz milk (almond milk is ideal) and a ripe banana. Organic hemp protein powder, organic coconut sugar, organic tapioca, organic guar gum, organic inulin (sunchoke), organic vanilla flavor, organic stevia. Made without hexane, dairy, or lactose.